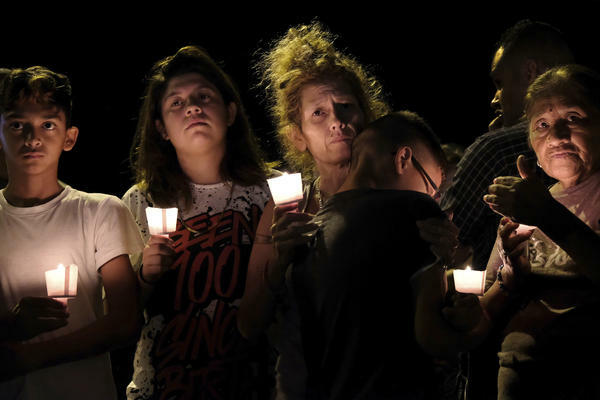 From left are Christopher Rodriguez, Esmeralda Rodriguez, Mona Rodriguez, Jayanthony Hernandez, 12, and Juanita Rodriguez participate in a candlelight vigil for the victims of a fatal shooting at the First Baptist Church in Sutherland Springs, Texas, Sunday. Law enforcement officers gather in front of the First Baptist Church after a fatal shooting Sunday in Sutherland Springs, Texas. Gov. Greg Abbott confirmed that at least 26 people were killed. A Texas Department of Public Safety official said the ages of the victims ranged from 5 to 72 years old. The AP reports that the pastor's 14-year-old daughter is among the dead. 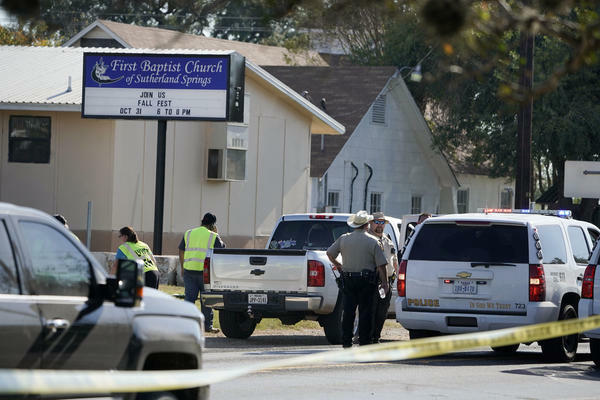 In a news conference, Freeman Martin, a regional director of the Texas Department of Safety, said 23 of those killed were found in the church, two were found outside the church and one died after being taken to a hospital. The Department of Public Safety confirmed to NPR that at least 20 others were wounded. A DPS official said in the news conference that the gunman was confronted by an armed civilian outside the church. The shooter has been identified as Devin Patrick Kelley, 26, according to a law enforcement official. Kelley previously served in the U.S. Air Force in New Mexico from 2010 until he received a bad conduct discharge in 2014, Air Force spokeswoman Ann Stefanek told NPR in an email. He was court-martialed in 2012 for assaulting his wife and child and sentenced to 12 months of confinement. Kelley died shortly after the attack. It's unclear whether it was self-inflicted or whether he was shot by a resident. Kelley lived in New Braunfels, northeast of San Antonio, records show. He attended New Braunfels High School, a classmate confirmed to KUT's Mose Buchele. In a statement, Tom Vinger of the Texas Department of Public Safety said, "The shooter was later found deceased in his vehicle in Guadalupe County. The exact circumstances of the gunman's death are still under investigation. The wounded individuals were transported to San Antonio Medical Center and University Hospital in San Antonio." KSAT television spoke with Fred Curnow, who lives near the church. Curnow said he heard gunfire. "I went to the window to look and I see an armed man dressed in riot gear — I guess that's what you call it — SWAT gear," Curnow said. "Fully masked, fully armored. He was just shooting the church from the outside." He said he saw the shooter return to a white SUV to reload. After the attack, the shooter reportedly exchanged gunfire with a nearby resident before getting in his vehicle and driving away. Martin said he could not confirm whether the neighbor hit the suspect, but said it was safe to say that his actions, which caused the shooter to drop his weapon, saved lives. KSAT spoke with Johnnie Langendorff, who said the man who exchanged fire with the suspect "came to my vehicle in distress with his weapon" and quickly explained what had happened. "The other gentleman came and said 'we need to pursue him. He just shot up the church.' "
Fewer than a thousand people live in Sutherland Springs. Kelsey Bradshaw, a reporter for the San Antonio Express-News, told NPR: "The number of people who are injured and killed make up about 10 percent of the entire population." David Martin Davies of Texas Public Radio told NPR's Noel King: "This is a blue jeans and working boots kind of church. It's a big part of the community." "While the details of this horrific act are still under investigation, Cecilia and I want to send our sincerest thoughts and prayers to all those who have been affected by this evil act," Gov. Greg Abbott said in a statement. "I want to thank law enforcement for their response and ask that all Texans pray for the Sutherland Springs community during this time of mourning and loss." "It's a small Baptist church. It's an older building," one witness who works nearby told MSNBC, adding that she heard "semiautomatic gunfire" from her vantage point about 150 yards away. "I never thought it would happen here. This is something that happens in a big city. I would never have thought this would have taken place here. It's just too tight a community. It doesn't make sense." Local media reported that law enforcement closed off the the scene, where emergency vehicles lined the streets and witnesses told of several helicopters overhead. FBI agents also arrived at the church. The Bureau of Alcohol, Tobacco, Firearms and Explosives tweeted that special agents from its San Antonio field office were on the scene. "May God be w/ the people of Sutherland Springs, Texas," President Trump tweeted. The president opened previously scheduled remarks in Tokyo on Monday morning local time with "thoughts and prayers" for the victims. He said he was sending "thoughts prayers and deepest condolences to victims of horrific assault on a church in a beautiful area. So sad." "In dark times, and these are dark times, such as these, Americans do what they do best and pull together," Trump said. "Through the tears and through the sadness we stand strong." He said his administration would provide support to Texas and the local authorities investigating the shooting.